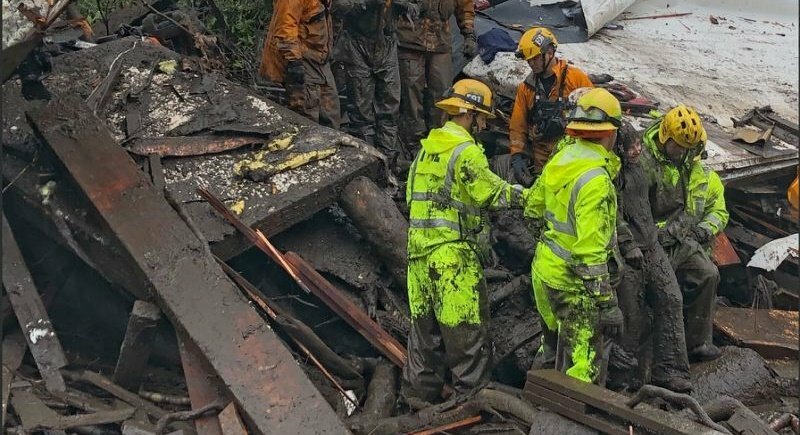 UNITED STATES: Mudslides unleashed by a ferocious storm demolished homes in southern California and killed at least 13 people, police said yesterday (Jan 9). The department posted pictures of rivers of waist-high mud flowing through neighbourhoods and roads rendered impassable by fallen trees. Roads were clogged throughout the region with mud flows shutting down more than 50 kilometres of the 101 Freeway and knocking a number of homes from their foundations. The highest rainfall total was recorded at 13 centimetres in Ventura County, according to the National Weather Service Los Angeles. About 275 traffic crashes were logged in the California Highway Patrol’s jurisdiction in Los Angeles County during the morning commute – compared with just 30 reported collisions during the same period on Tuesday last week (Jan 2).